José de la Cruz Porfirio Díaz Mori (September 15, 1830 – July 2, 1915) was a Mexican-American War volunteer, French Intervention hero, and President. He ruled Mexico from 1876 to 1880, and from 1884 to 1911. After a distinguished military career, Díaz parted company from his former colleague, President Benito Juárez, disliking his federal reforms and preferring a strong center and, in 1876, following a successful rebellion, he became President himself. Over the next three decades, despite many revolts against his administration, he centralized authority by undermining the power of regional leaders and by populating the legislature with people loyal to himself. Favoring the Creoles, he totally ignored the rights and needs of indigenous peoples. Due to national debt, he encouraged foreign investment. On the one hand, Mexico had suffered from foreign involvement in its wars, on the other it wanted to improve its international reputation as a safe place for investment, trade and commerce. Diaz's years in power did nothing to make Mexico a more just society, or to tackle racial divides, but it was a period of relative political stability and of economic growth. However, the elite few benefited at the cost of the many, so that at the end of his presidency about 10 percent of the population owned 20 percent of the land. Diaz encouraged industrialization, Diversifyingthe economy with mining and oil as well as agriculture. Consequently, however, food become scarce. This was a major contributory factor to the Revolution of 1910, which resulted in his flight from Mexico. Porfirio Díaz was born September 15, 1830, in the city of Oaxaca, Oaxaca. He was a mestizo, of Creole and Mixtec (a Mesoamerican tribe) ancestry. His father, José Faustino (de la Cruz) Díaz Bohorques, was a modest innkeeper and died when Porfirio Díaz was three years old. His mother, Petrona Mori Cortés, later tried to keep the inn going but the business failed. She sent young Porfirio to the Seminario Conciliar in 1843, but he was not cut out for the priesthood. He joined the local military in 1846, dreaming of defending his country from a threatening United States invasion. In 1850, Porfirio entered the Instituto de Ciencias y Artes to study law. He was married twice, and had a son and two daughters. His second wife was Maria del Carmen Rubio Romero Díaz, who he married in November 1882. Díaz soon became a prominent local activist and politician in the liberal opposition to the conservative Santa Anna dictatorship. In 1858 during the War of the Reform, a Civil War that aimed to reduce the power and influence of the Roman Catholic Church, he participated in the occupation of Oaxaca on the Liberal side. In April of that year the state governor appointed Díaz military commander and governor of the Department of Tehuantepec. That same year he was promoted to major. In 1859, he was promoted to lieutenant colonel. In 1860, following his victory in Ixtepeji, north of Oaxaca, he was promoted to colonel. In 1861, in recognition of his victory in Jalatlaco he was promoted to brigadier general. The participation of General Porfirio Díaz in the Battle of Puebla that took place May 5, 1862, is commonly mistaken with that of the general's brother, Felix Díaz. It is believed that General Díaz led the volunteer cavalry that protected the flanks of the Mexican army during the battle, but this was in fact his brother Felix who was in charge of a unit of volunteer lancers. By the time of the battle, General Díaz had reached the rank of brigade general in charge of an infantry brigade. According to the biography written by General Bernardo Reyes, General Díaz's brigade was placed in the center between the forts of Loreto and Guadalupe, where he repelled a French infantry attack that was sent as a diversion to distract the Mexican commanders' attention from the forts that were the main target of the French army. General Díaz with his unit fought off a larger French force and then chased after them, in violation of the orders of General Ignacio Zaragoza, who commended the actions of General Díaz during the battle as "brave and notable." There was a second battle of Puebla, fought April 2, in which the Díaz did lead cavalry units against conservative positions around the city. In 1863, Díaz was captured by the French Army. He escaped and was offered by President Benito Juárez the positions of secretary of defense or army commander in chief. He declined both, but took an appointment as commander of the Central Army. That same year he was promoted to Division General (similar to Lieutenant General). In 1864, the conservatives supporting Emperor Maximilian, Napoleon Bonaparte's appointee, who owed his power to the chaos caused by the War of the Reform, asked him to join the imperial cause. Díaz refused. In 1865, he was captured by the Imperial forces in Oaxaca. He escaped and fought the battles of Tehuitzingo, Piaxtla, Tulcingo, and Comitlipa. In 1866, Díaz formally declared his loyalty to Juárez. That same year he earned victories in Nochixtlan, Miahuatlan, and la Carbonera and once again captured Oaxaca. He was then promoted to general. 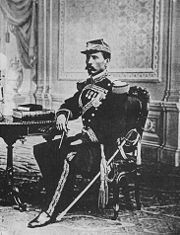 Also in 1866, Marshal Bazaine, commander of the Imperial forces, offered to surrender Mexico City to him if Díaz withdrew support of Juárez. The offer was declined. In 1867, Emperor Maximilian offered Díaz the command of the army and the imperial rendition to the liberal cause. Díaz refused both. He went on to win the final battle for Puebla on April 2, 1867. He remained popular well after the defeat of the French and the death of Juárez in 1872. In 1870, Díaz ran as presidential candidate against President Juárez and Vice President Sebastián Lerdo de Tejada. In 1871, he made claims of fraud in the July elections won by Juárez, who was confirmed as president by the Congress in October. In response, Díaz launched the Plan de la Noria (November 8, 1871), supported by a number of rebellions across the country. In March 1872, Díaz's forces were defeated in the battle of La Bufa in Zacatecas. Following Juárez's death on July 9, of that year Sebastián Lerdo de Tejada assumed the presidency and then offered amnesty to the rebels. Díaz accepted in October and "retired" to the Hacienda de la Candelaria in Tlacotalpan, Veracruz. In 1874, he was elected to the Mexican Congress from Veracruz. That year Lerdo de Tejada's government faced civil and military unrest, and offered Díaz the position of ambassador to Germany, which he refused. In 1875, Díaz traveled to New Orleans and Brownsville, Texas, to plan a rebellion, which was launched in Ojitlan, Oaxaca, on January 10, 1876, as the Plan de Tuxtepec. After appointing himself president on November 29, 1876, he served one term and then stepped down in favor of his hand-picked successor Manuel González, a trusted general, one of his underlings. The four-year period that followed was marked by corruption and official incompetence, so that when Díaz stepped up in the next election he was a welcome replacement, and there was no remembrance of his "No Re-election" slogan. During this period, the Mexican underground political newspapers spread the new ironic slogan for the Porfirian times, based on the slogan "Sufragio Efectivo, No Reelección" (Effective suffrage, no re-election) and changed it to "Sufragio Efectivo No, Reelección" (No effective suffrage, Re-election). In any case, Díaz had the constitution amended, first to allow two terms in office, and then to remove all restrictions on re-election. He maintained power through manipulation of votes, but also through simple violence and assassination of his opponents, who consequently were few in number. He was a cunning politician and knew very well how to manipulate people to his advantage. A phrase used to describe the order of his rule was "Pan, o palo" ("Bread, or the stick"), meaning that one could either accept what was given willingly, or face harsh consequences. From 1892, onwards Díaz's perennial opponent was the eccentric Nicolás Zúñiga y Miranda, who lost every election but always claimed fraud and considered himself to be the legitimately elected president of Mexico. Díaz embarked on a program of modernization, attempting to bring Mexico up to the level of a modern state. His principal advisers were of a type called científicos, akin to modern "technocrat" economists, because they espoused a program of "scientific" modernization, including the building of railroad and telegraph lines across the country, including the first Mexican railway (between Veracruz and Mexico City). Under his rule the amount of track in Mexico increased tenfold; many of these rails remain in operation today without remodeling. He introduced the idea of steam machines and technological appliances in industry and invited and welcomed foreign investment in Mexico. He also encouraged the construction of factories in Mexico City. This resulted in the rise of an urban proletariat and the influx of foreign capital (principally from the United States). However, while the economy benefited from diversification, only the elite gained. By the end of his presidency, Mexico was suffering from a severe food shortage. 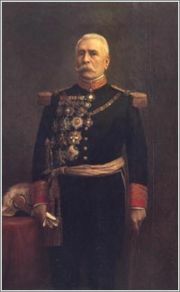 Early in his career, Díaz realized that the principal foreign threat to Mexico was the United States, and that the Mexican army stood no chance of defeating the U.S. Díaz adjusted Mexican foreign policy to keep the peace with the U.S., reduced the size of the Mexican army and used the peace dividend to put Mexico's budget into better condition. The growing influence of U.S. businessmen, already a sore point in a Mexico that had lost much land to the United States, was a constant problem for Díaz. His modernization program was also at odds with the owners of the large plantations (haciendas) that had spread across much of Mexico. These rich plantation owners wanted to maintain their existing feudal system (peonage), and were reluctant to transform into the capitalist economy Díaz was pushing towards because it meant competing in a global market and contending with the monetary influence of businessmen from the United States. Though he wished to modernize the country, Díaz by no means opposed the existence of the haciendas, and in fact supported them strongly throughout his rule. He appointed sympathetic governors and allowed the plantation owners to proceed with a slow campaign of encroachment, using the Ley Lerdo, onto collectively owned village land, and enforced such seizure through his well-equipped rural police (rurales). This concentrated more and more land in the hands of fewer and fewer people. Díaz - Creelman interview, Pearson's Magazine, 1908. In a 1908, interview with the U.S. journalist James Creelman, Díaz stated that Mexico was ready for democracy and elections and that he would step down and allow other candidates to compete for the presidency. The governor of Nuevo León, Bernardo Reyes, announced his plans to run for president. However, Díaz sent Reyes on a mission to Europe, so Reyes was unable to compete in the elections. University of California, Berkeley–educated Francisco I. Madero answered the call for candidates. Although Madero was very similar to Díaz in his ideology, he hoped for other elites in Mexico to rule alongside the president, unlike Díaz. Díaz, however, did not approve of Madero and had him jailed during the election in 1910. Despite this, the election went ahead. Madero had gathered much popular support, but when the official results were announced by the government, Díaz was proclaimed to have been re-elected almost unanimously, with Madero gathering only a minuscule number of votes. This indisputable case of massive electoral fraud aroused widespread anger. Madero called for revolt against Díaz, and the Mexican Revolution began. 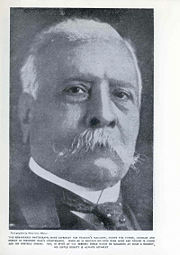 Díaz was forced from office and fled the country for France in 1911. Madero was assassinated in 1913. On July 2, 1915, Díaz died in exile in Paris; he is buried there in the Cimetière du Montparnasse. Referring to his policy of co-opting political opponents, Díaz reportedly said, "a dog with a bone neither barks nor bites" or "a dog with a bone in its mouth neither steals nor kills." As he headed for exile in May 1911, following the revolt by Francisco Madero, Díaz reportedly remarked, "Madero has unleashed a tiger; let’s see if he can control it." Díaz was a brilliant man, who was able to take control of Mexico for a time. He was determined to bring Mexico more prominence than it had enjoyed since the days of Spanish colonization. He helped to produce interest in the country from outside and hoped to make a place for it in the world. Throughout it all, Díaz remained a calculating and determined individual. ↑ David Hannay, Díaz (Port Washington, NY: Kennikat Press, 1917), 1-3. Bancroft, Hubert Howe. Life of Porfirio Díaz. San Francisco: A.L. Bancroft & Company, 1885. Beals, Carleton. 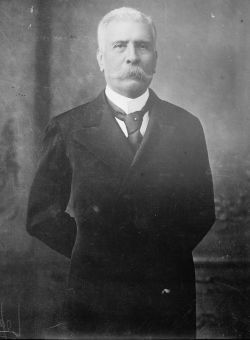 Porfirio Díaz, Dictator of Mexico. Philadelphia: J.B. Lippincott Company, 1932. Cumberland, Charles C. Mexican Revolution: Genesis Under Madero. Austin: University of Texas Press, 1952. Godoy, Jose Francisco. Porfirio Díaz, President of Mexico, the Master Builder of a Great Commonwealth. New York: G.P. Putnam's Sons, 1910. Hannay, David. Díaz. Port Washington, NY: Kennikat Press, 1917. Perry, Laurens Ballard. Juárez and Díaz: Machine Politics in Mexico. Dekalb: Northern Illinois University Press, 1978. Villegas, Daniel Cosío. The United States Versus Porfirio Díaz. Translated by Nettie Lee Benson. Lincoln: University of Nebraska Press, 1963. This page was last modified on 22 May 2015, at 20:56.